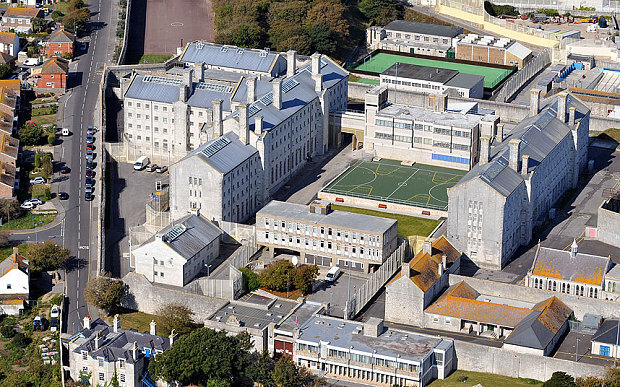 HMP Portland is a male Adult/Young Offenders Institution, located in the village of The Grove on the Isle of Portland, Dorset, England. The establishment was originally opened in 1848 as an adult convict establishment, before becoming a Borstal in 1921, and a YOI in 1988. In 2011 the prisons became a dual-functioning Adult/Young Offenders establishment. The establishment operates as a Category C and has a designated role as a Resettlement prison. The main resettlement counties are Hampshire, Somerset, Gloucestershire, Wiltshire and Dorset. All learners have the opportunity to progress to further learning and acquire qualifications and the skills and knowledge that enables them to progress. Learners can progress within the education department at Portland through a curriculum which has been individualised to learner need, learners are also signposted to the education provision in other prison establishments upon transfer. "My confidence has grown massively..."
"My confidence has grown massively and I'm always learning new things due to great teachers and great surroundings. "While on my first course, i took the opportunity to learn Employability Level 1: "Be your Own Boss" and on my second I was invited to learn English Level 2. I always found English my weak point but with all the attention that was needed, I passed first time." 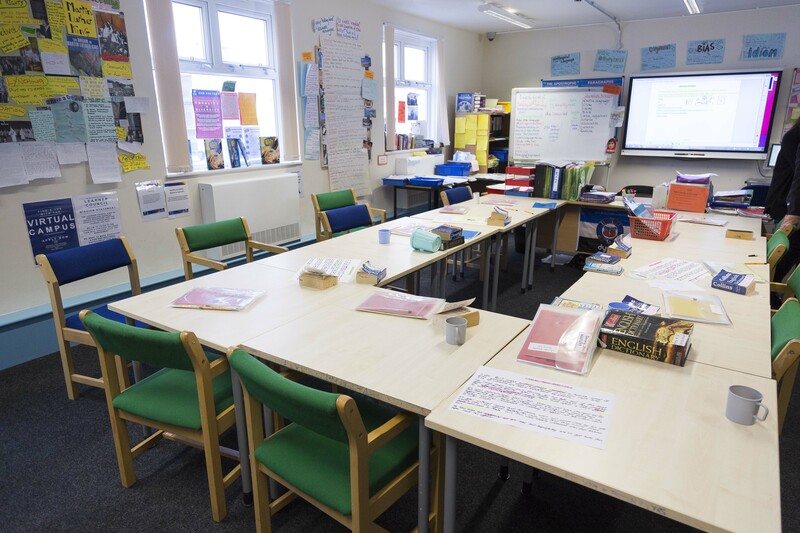 Over the last couple of years learner celebration events have become a regular part of the education calendar at HMP YOI Portland but since November 2015 a new element has been added which really motivates the learners to achieve and be nominated this is where family members are invited to attend the events. For some, this is the first positive family experience they have shared for a long time and it is emotional to see the pride on family faces as their loved one receives their award and they hear about the good things that are possible within the establishment environment. Celebration Events ‘show off’ their work and portfolios to their families. Dorset Fingerpost Refurbishment Project: Here in Dorset we are incredibly fortunate to live in a beautiful part of the country with such a variety and wealth of natural features as well as interesting man-made structures. Both contribute to the decidedly unique appearance of Dorset’s landscape and rural heritage. 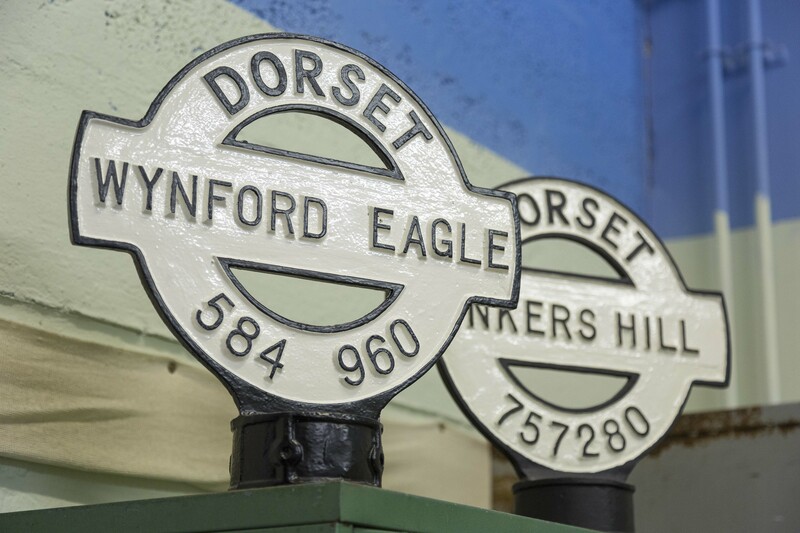 Fingerposts are one of Dorset’s rather quaint relics from the past, which have developed into being iconic symbols of the county in the present. These fingerposts, along with narrow lanes, overgrown hedges, beautiful flower-filled verges, bridges with distinctive signs and redundant red telephone boxes, all contribute to Dorset’s unique charm and character. The fingerposts are a legacy of the initial road system. They were widely used during the reign of the turnpike roads when turnpike trusts were encouraged to label every mile to help stagecoach drivers keep to their schedules. Later, in 1773, the General Turnpike Act made it obligatory for trustees to put up signs informing the traveller of the distance to the nearest town. Later again, as a result of the 1903/4 Motor Car Act, responsibility for the provision of fingerposts was given to individual local authorities. Posts were therefore designed and erected by local authorities throughout the land. The Ministry of Transport recommended a design but it was left up to individual councils to make the final decision, which meant that there was a wide variety of local styles. Dorset created its own distinctive and unique finger post design, which add to the local character of a place, but are now, in certain places, in danger of being lost, forever. Unfortunately our Dorset Fingerposts are in decline. Many have been repaired over recent years using non-traditional materials or lettering, replaced using ill-considered new versions. Many are currently in need of some tender loving care and unfortunately some have already been lost. The collaboration between Weston College, HMP/YOI Portland and local organisation Dorset Areas of Outstanding Natural Beauty will result in many signs being traditionally restored to their former glory, enhancing the unique look to our beautiful towns, villages, and countryside. Learners in the Painting & Decorating workshop have the opportunity to be involved in this worthwhile project, with the preparation and painting processes mapping over to practical units included in the City & Guilds level 2 Diploma in Painting & Decorating. Additional skills will be gained and a sense of pride and satisfaction will be evident in relation to the completion and re-positioning of refurbished Fingerposts. Fingerposts are collected from all over the county by D.A.O.N.B. and delivered to Portland prison. These signs are usually in a very dilapidated state with many metal letters either broken or missing. The majority of wooden signs are beyond repair and will be replaced with new timber, but refurbishing the original letters will keep with tradition. All learners are encouraged to partake in all stages of the preparation process, adding new skills to an already growing painting knowledge base. Workshop Peer Mentors will assist in all aspects of preparation and painting. Metal surface preparation tasks are mapped over to unit 215, which is part of the City & Guilds level 2 Diploma in Painting and Decorating. 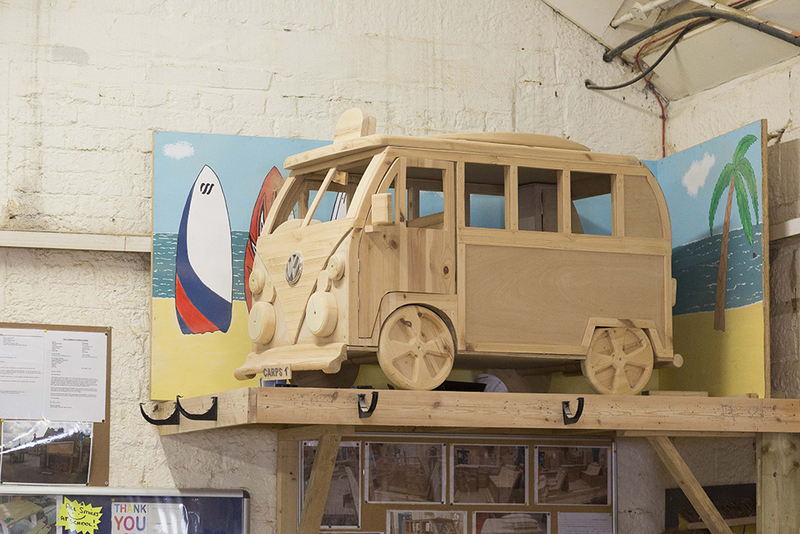 The WoodLocker has been established to provide bespoke wooden handcraft to all. The Business will be run along side the Carpentry Diploma offered by Weston College and will provide the learners with a real life environment to further improve there skills and knowledge base. The project under taken by the Woodlocker have increased ten fold and there is no a backlog of projects to be under taken. There have been a number of very prestigious projects already taken on by the WoodLocker, such as charity work for the local community and schools, garden sheds and a number of smaller projects. Kew Gardens Project at HMP Portland: In 2016 we made an application to a project owned by Kew Gardens which offered funding to grow wildflowers in areas accessed by members of the public. The Old Education Yard Portland qualified as an area which could be improved and our project was awarded a grant. Learners in all classes and workshops were offered an opportunity to design the area and from the shortlist a design was approved. The learners in the horticulture workshop then grew the wildflowers ready for the next stage of the design which was removing some of the slabs from the yard and planting wildflowers there. This took place over the next 4 weeks. The carpentry learners made the seating slats for the gabion basket benches and made the wall plaques. On the 18th of July Clare Dalton visited Portland to discuss the progress we had made towards realising the design and was impressed by how much could be achieved on a relatively modest budget. Clare expressed her delight in the horticulture learners’ input (drawing the design, growing the wildflowers and planning for their planting) and the input from other classes and workshops (constructing the slats for the seating and the ‘motivational’ themed wall art).